As a whole, the HR profession has made little progress in its pursuit of a less transactional, more strategic role. However, some organizations have figured out how to spend less time on administrative HR and more time developing strategic HR partnerships. 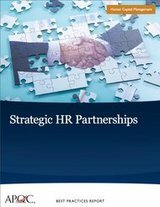 In 2013, APQC conducted a research study to examine best practices in strategic HR partnerships. APQC selected IBM Global Business Services and Nissan North America Incorporated to study and uncovered 10 best practices for developing and maintaining a strategic HR partnership. This report reviews the details of these practices and includes in-depth case studies of these organizations.